High maritime activities in the Persian Gulf and the Gulf of Oman as the major waterways for oil and gas transport and the lack of a documented database on total taxa diversity require greater attention for the biodiversity of these environments. The available marine biodiversity data in Iran are sparse and abandoned on libraries’ shelves and, as such, accessing relevant and reliable current information about the status of Iranian southern seas biodiversity is challenging. Therefore, there is an urgent need to extract, standardize, and evaluate these biodiversity data. 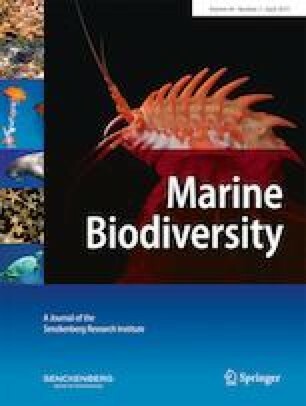 A comprehensive review of the available biodiversity data on the Iranian southern seas provided an estimate about the species diversity and highlighted the amount of reliable biodiversity data, research gaps, and required information for the lesser-known areas. In the present review, the available biodiversity data records of the Persian Gulf and the Gulf of Oman under Iranian ownership was extracted from non-database information sources (books, theses, research reports, and articles) and open-access database portals, such as the Ocean Biogeographic Information System (OBIS), Global Biodiversity Information Facility (GBIF, https://doi.org/10.15468/dl.jm7hat), and those museum collections with online portal data collection search facilities. In total, 59,745 biodiversity records were extracted from all information sources. After data standardization based on the OBIS data scheme (Darwin core format), eight criteria with 29 sub-criteria were considered and scored to measure the validity of each record. Consequently, the presence of 3364 valid species (more than twice the number predicted earlier for the total species diversity) was reported for the study area. Describing new species shows an increasing trend, as most of the 80 new species until the beginning of 2018 were described recently. Mollusca phylum had the most amount of synonymy in non-database information sources. The results show that some marine taxa have been ignored in previous studies and the focus was on a certain group of organisms. Multi-criteria scoring analysis shows that 6% of the extracted biodiversity data for non-database information sources have 75–100% credit (valid), 70% have 50–75% credit (semi-valid), 23.4% have 25–50% credit (a little valid), and 0.9% have 0–25% credit (invalid). On the other hand, OBIS data extracted for Iran do not have invalid data due to its good data quality control, but 58 and 20% of its extracted data are semi-valid and valid, respectively. We believe that all of the eight mentioned criteria are required for reporting biodiversity data, and our proposed weighting system helps different users who need to know how reliable is the published data. We appreciate the Iranian National Institute for Oceanography and Atmospheric Science (INIOAS), which provided the required grant (project grant number: 392-011-05). We thank the sincere cooperation of academic library administrators as well as various research centers. The authors also appreciate the respectful anonymous referees for their valuable comments, which made the article better. This article is dedicated to Professor Jamshid Darvish, a great man in the field of biodiversity studies in Iran, who passed away in recent days.